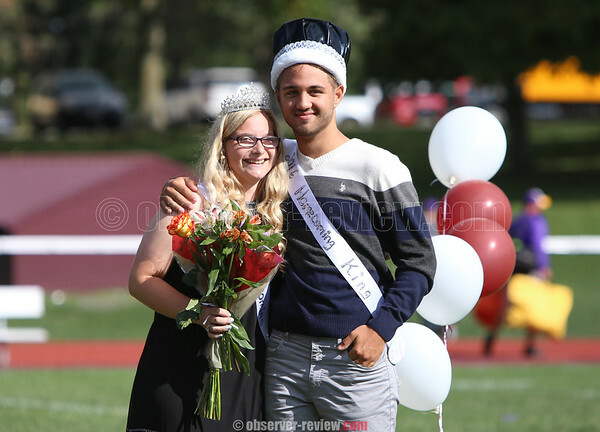 DUNDEE--Dundee celebrated their homecoming Saturday, Sept. 24, by naming K-Leigh Van Zile and Bobby Strait the homecoming queen and king. The crowning took place following the conclusion of the annual homecoming football game, where the Dundee Scots were defeated by the Clyde-Savannah Golden Eagles 49-6. The Scots are now 1-3 heading into a road contest at South Seneca Friday, Sept. 30. The Golden Eagles received the ball to open the game and drove down to the Dundee two yard line. While Clyde-Savannah fumbled on the next play, one of their linemen recovered the ball across the goal line to take a 7-0 lead. The Golden Eagles extended their lead to 14-0 after forcing Dundee to punt on their first possession, recovering one of their own fumbles and completing a tipped pass during the drive. The teams swapped turnovers on their next drives, with Clyde recovering a Dundee fumble before throwing an interception to Brayden Eatherton. The score would remain 14-0 Clyde to end the first quarter. After Dundee was forced to punt, their defense attempted to stop the Eagles' offense, but a 61-yard touchdown pass extended the lead to 21-0. The teams exchanged interceptions on the next two drives, with Dundee's Tyler Brace coming away with the pick. After being forced to punt, Ryan Prior got an interception of his own to give the Scots the ball back. However, after throwing a pick-six, Dundee's offense was scoreless going into halftime down 28-0. Clyde-Savannah seized the momentum to open the second half, forcing a turnover on a strip sack and scoring on their next drive. The Golden Eagles also returned a Dundee punt and scored on a 93-yard run to end the third quarter with a 49-0 lead. Jared Jayne got Dundee's only points of the game late in the fourth quarter on an eight-yard rush to put the final score at 49-6 Clyde-Savannah. "Sometimes the ball bounces like that," Head Coach Sheldon Gibson said. "It's a difficult thing to have a short memory, which you must have in football to be able to come back the very next play and make good. We are very young this year. We are kind of in a rebuilding year, but we are going to go right back to work next week and see what we can do against South Seneca." At the end of the game, Van Zile and Strait were crowned the homecoming queen and king. They were selected out of a court including Andi Wood, Emily Oughterson, Samantha Scott and Madison Hill for the girls, and Johnathen Clancey, Cody Robbins, Tony Thompson and Michael Shearin for the boys.